Our students love reading series, there's no question about it. Of our top 20 fiction books (typically for 4th and 5th graders), all but 3 are part of series. I teach at a very diverse, urban elementary school in Berkeley, California. It's clear from these statistics that our students love books that combine humor, realistic fiction and friendship issues. Today I'll highlight the most popular fiction series; my next post will focus on other novels that our students have loved. No surprise here: the Wimpy Kid rules. Our students love the Wimpy Kid, checking out all of the different books time and again - nearly double the other series. Kids connect with Greg. When they read these books, they laugh at all the crazy situations, but they also feel like they're not the only ones who act like complete doofuses, goofing up every situation. And that's a good thing. I have noticed that our students checked out the Wimpy Kid books much more in the beginning of the year than at the end - I wonder if kids are finding their Wimpy fixes in other series? This year, Lauren Myracle's books about Winnie - Ten, Eleven, Twelve, etc. - just took off at our school. At the beginning of the year a few 5th grade girls read them and loved them. They passed them to their friends, who recommended it to others. Girls have talked about the way Winnie has to go through "girl drama", friendship troubles, popularity issues. They connect with Winnie and reflect on their own friendships. Toward the end of the year, after this momentum had built up, I arranged a Skype visit with Lauren Myracle. Our students loved the chance to talk with an author they so admired. I have loved seeing how this series resonates with students. Ignatow has created two likable characters who wrestle with friendship issues, school drama and family dynamics. Kids love her visual, colorful style - almost a scrapbook style, with bits of Julie and Lydia's journals, notes, emails and drawings. The only caveat: Lydia writes in cursive, so kids need to be able to read cursive fluently. But this doesn't stop my students from loving this series! Dork Diaries follows eighth grader Nikki Maxwell as she navigates the ups and downs of moving to a new school, dealing with friendship and social issues, and negotiating for more freedom and privileges at home. Like the Wimpy Kid and the Popularity Papers, this series incorporates a lot of illustrations throughout the text and centers around likable, humorous characters in situations kids can relate to. Parents sometimes worry that this isn't "real reading", but I would encourage you to give your child time and space to read these series. First of all, quantity matters. So eating up these fast-moving, fun series helps kids enjoy reading. That's huge! Secondly, tweens need space to think about all the social changes they're seeing around them. Reading these friendship stories where characters wrestle with so many common problems is a safe way for kids to think about dilemmas they may be experiencing themselves. Are you noticing a common theme here? Yep, our students love funny series. Big Nate is another winner with our kids, who love reading about Nate's struggles with organization, tests, and detentions. Big Nate appeals to kids much like the Wimpy Kid and Dork Diaries, but it's slightly easier to read. It still feels like a big book, but it's more accessible for a 3rd grader. Fantasy series like Rick Riordan's Percy Jackson books, the 39 Clues series, and the Warriors books are popular at our school, but not on the same wide-spread scale as these funny, realistic series. What I like about reviewing these circulation figures is that it reminds me to keep looking out for new series in the same vein. Do you have any favorite series you think our students would like? Next, I'll be sharing individual fiction titles that were very popular at our school this year. There are some surprising results there! ©2012 Mary Ann Scheuer, Great Kid Books. We're about to say goodbye to our students for the summer. This always leaves me with mixed feelings. On one hand, I can't wait for the summer break - a chance to spend time with my family, to relax, to read. On the other hand, I miss my students terribly. I want to keep hearing what books they're reading and finding. For many of our students, the school library is the main way they find books that are just right for them. This year, I've developed summer reading lists for our students, and I wanted to share them here. They are organized by the grade students have just left. I've used the reading levels students have mastered to organize these lists - our parents will receive report cards with the students' levels on them. Our school has adopted the Teachers College Reading and Writing Program, developed by Lucy Calkins and her associates, and I've been so very impressed with the way our teachers are implementing this. Parents play a crucial role in supporting their children's reading, and this is especially true during the summer. Yet I know how overwhelming it can be walking into the library and trying to figure out what book will be just right for your child. The real trick, I've found, is to check out a stack of books you think might be right, and let your child browse through them. Encourage your child to read the first few pages and think about whether they're just right for them. Do they find them funny or interesting? Can they read them fluently? Engage in those types of discussions with your kids as they find books for the summer. I would love feedback on whether you're able to download these lists and if they're helpful. Have a great summer - I hope you can find some time to hide away and read! Excited about 2012 ALA Annual Meeting! I am thrilled to be attending the 2012 American Library Association annual meeting in two weeks - I can't believe it's so soon. Yes, I'm a total book-geek, and I look forward to this conference all year. It's a chance to see friends from around the country, share our passion for children's books, and listen to amazing speakers. Are you going to ALA this year? If you will be in town on Friday, June 22, join us and the folks at Walden Pond Press for a middle grade meet-up! This is a chance for all you middle grade supporters to chat about everything middle grade - from book recommendations to best read-alouds to author visits to how you can help support this sometimes overlooked category of books. Here are all the details - feel free to tweet us, post on our Facebook wall or leave a comment if you'd like to join us. No RSVP necessary, but letting us know of your interest gives us a good idea of how many people to expect. This is a completely free and open event - anyone can come. We hope to see you there! As librarians, we bring so much to our school sites; but often I'm not quite sure how to share this with my whole staff. I came into a site where they still look at the librarian as "the book person", the nice lady who reads stories to the children and checks out books. I love reading stories to the children, but I know I can bring so much more to my school and district. I'm excited to learn and grow in this preconference! The Common Core is heading our way, no matter what we think of it, and it's vital that we know how we can best support our teachers and students. The more that I can learn about the Common Core, the more I can be a part of the conversation as our district wrestles with our state's adoption of the Common Core. Lori Takeuchi, director of research at the Sesame Workshop's Joan Ganz Cooney Center, will present their research on how parents nationwide feel about raising children in a digital age. I've read about this research in different journals and am fascinated to learn more. I was very moved by several of the Coretta Scott King awards this year, most especially Kadir Nelson's Heart and Soul (did you see that it won an Audie Award last week? Hooray!). I am looking forward to joining this celebration with a big group of librarians from the Association of Children's Librarians of Northern California. Yes, I know this is an early session, but it promises to be uplifting, moving and interesting! A stellar panel of librarians, professors and authors will lead a discussion on how the realities of access to information in the digital age and the emerging Core Curriculum requirements will affect our evaluation of nonfiction. This panel will debate a new framework for understanding, creating, evaluating and using the new nonfiction...and maybe even define it. Argh, sadly I have a committee committment at this time, so I'll be depending on friends to take and share good notes! Are you going to ALA? What sessions are you excited about? I'll be microblogging over at the ALSC Blog, and giving a more general wrap-up here. I always want kids to find books they like to read, but it's also so important for them to find books that are "just right books" for them. As kids develop their reading skills, they need to think about what books they can read smoothly and understand the story. Humor is a real draw for readers at this age. Nick Bruel's Bad Kitty series makes me laugh out loud, with its blend of Garfield the cat grouchiness, big and bold line drawings, and wacky nonfiction tidbits. Kids know just how Bad Kitty feels with the indignation of having to share their home with a little brother or sister. In Bad Kitty Meets the Baby, Kitty must figure out just what this thing is that her people have brought home! It's a stinking, drooling mess - and Kitty is sure it's a dog. Until she realizes it must be a baby... Our kids also adored Bad Kitty Takes a Bath, the first in this hilarious series. These books make kids laugh, love reading and feel like there are kids out there as goofy as they feel so much of the time. These best friends are as different as can be, and yet they love spending time together, getting into all sorts of mischief and just having fun. My students love, love this series - coming back to it again and again. 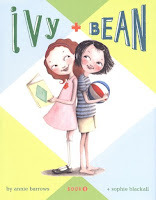 Did you know that Ivy and Bean go to Emerson School, just like my students? True fact, true fact. We're so excited for a new Ivy and Bean to come out this fall: Ivy and Bean Make the Rules (Book 9). We have great debates about which books are better - the Judy Moody books, or those about her younger brother Stink. Clearly, Stink has won the day at our library! Kids love the snappy dialog, the light humor and Stink's outlook on life. The book design makes the Stink books really accessible to kids, with the large print and plentiful illustrations. This year, kids loved Stink and the Incredible Super-Galactic Jawbreaker, as Stink becomes obsessed with getting free stuff in the mail. Definitely a crowd-pleaser! Our 3rd and 4th graders love the action, adventure and fantasy in the Beast Quest series. This year, Ferno: the Fire Dragon, the first book in the Beast Quest series, was one of our most popular chapter books. From the British Beast Quest website: "An evil wizard has enchanted the magical beasts of Avantia - only a true hero can free the beasts and stop them from destroying the land. Is Tom the hero Avantia has been waiting for?" This half-comic book, half-chapter book series combines humor, action and fantasy in a perfect blend. Whenever twins Stephanie and Zeke are sucked into the underworld, the story switches to comic book panels. Kids love the adventure, wacky characters, and plentiful puns. Here's my review of the first in the series: The Prince of Underwhere. Other series that our kids have loved include the Rainbow Magic fairy books, Jon Scieszka's Spaceheadz series, Ruby and the Booker Boys, and the Clementine series. What chapter books are popular with your kids? Check out what was popular at our school last year in this post: Great chapter books, 2010-2011.
Review ©2012 Mary Ann Scheuer, Great Kid Books. The school year is winding down and each year I look at our circulating statistics to see what our students are checking out. Numbers really do reveal patterns - books that catch fire a certain year, and trends year to year. I'd like to share our most popular books by category in our library. I'll start with the most popular category - graphic novels, move on to fiction, then share beginning readers, picture books and nonfiction. I teach in a diverse, urban elementary school in Berkeley, California. We have about 300 students, and checked out over 14,000 books during the 2011-2012 school year. Our students check out two books each week for one week. Our students have loved the action and adventure that Roscoe and Fluffy get into, as they try to prove to Captain America that they will be loyal, steadfast sidekicks. This graphic novel pulls in readers from as young as 1st and 2nd grade all the way up to 5th grade. Great art, great story, great characters = a winning combination from Dan Santat. Based on Raina Telgemeier's real life dental drama, Smile captures the ups and downs of peer pressure, anxiety and friendship issues in middle school. This book appeals to girls who love the realistic friendship story, boys who love the visual storytelling, all students who can relate to the school drama. Our students are thrilled to learn that Raina has a new book out this fall: watch for Drama in September! From the daring duo who created Babymouse, this is the first in their new series Squish - a definite winner in my students' opinion! Squish is your regular kid who loves to read comic books, eat twinkies and hang with his friends. Well, a regular kid, except that he's an amoeba. A what? Yes, he's an amoeba, a single celled organism who hangs out in your local pond. Jenni and Matt Holm capture so many real aspects of being a kid, and yet they've created these fun, silly creatures with clear fantasy twists. Hooray for the Lunch Lady and the Breakfast Bunch! They discover some suspicious paintings on a field trip to a local museum, and are determined to get to the bottom of this mystery. The Lunch Lady series continues to be wildly popular at our school, again drawing a wide range of students from 2nd grade through 4th and 5th grade. Raina Telgemeier created this graphic adaptation of Ann Martin's best-selling series over 6 years ago, and each year our 3rd graders discover it, falling in love with these friendship stories. This is the sort of books kids carry everywhere - to soccer games, in the car, to the lunch room. Yes, I have to keep replacing our copies, but I love the way it hooks kids into reading! Yes! Squish certainly has appealed to our students! Here's the publisher's description of Brave New Pond: "He's baa-ack! It's a brand new school year for everyone's favorite AMOEBA! Will Squish finally get to sit with the cool kids at lunch? Will Pod stop the giant asteroid from destroying the world? Will the LEECHES be the end of Super Amoeba? And what makes cafeteria nachos so delicious anyway? Find out the answers to these questions and more in Squish's second electrifying, action-packed adventure." This was the first graphic novel I read, and the combination of story and artwork still fascinates me! I was not a comic-book reader as a kid, but I loved fairy tales. They captured my imagination. So when I read Shannon and Dean Hale's twist on Rapunzel set in the Old West, I loved it! Add to that amazing, vibrant visual storytelling from Nathan Hale and you have a book that keeps intriguing children. This is a great example of a long, complex story that hooks kids. The Amulet series took off in our school this year, first with a group of 5th grade boys and then spreading out to a wider group of students, ranging from 3rd through 5th grades. They love the intricate storytelling, the adventures and dangers facing Emily and her friends, and the fantasy world they explore. My students have been hotly debating whether a 5th book is in the works. I'm not sure if a publication date has been set, but I do know that Kazu Kibuishi has been working on the sequel. This quirky story appeals to kids who love visual storytelling, a cast of characters and short mini-stories within the overall story. Hakata Soy struggles to adjust to his new school, Astronaut Academy, especially after the most popular girl starts picking on him. The Babymouse series continues to draw readers multiple times. Our Hero and A Very Babymouse Christmas were checked out 29 times. Other popular Babymouse books include Babymouse: Rock Star, Babymouse: Cupcake Tycoon and Babymouse: Skater Girl - all in our top 20 graphic novels. Babymouse love is still going strong at our school! Many libraries shelve the graphic novels in the nonfiction section. We've pulled them out and given them their own space next to fiction because they appeal to students much like fiction does, with creative, inventive stories. If you'd like to see a broad range of other nonfiction, head over Nonfiction Monday. Today it's hosted by True Tales with a Cherry On Top!